The Spaniel family is a large one, of considerable antiquity. There are two varieties of Cocker Spaniels – the English and the American. The American Cocker Spaniel is not a crossbred dog. It evolved in the US where breeders developed it from the English Cocker Spaniel to become the glamorous American type we see today. 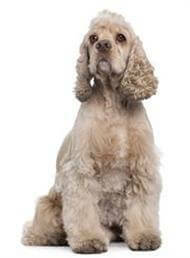 The feisty American Cocker Spaniel usually lives to 12 years of age but can live up to 14 years when living in a caring home and fed the correct diet. The American Cocker Spaniel female usually weighs about 10kg to 12kg and is 33cm to 36cm in height, while the male’s ideal weight is from 12kg to 15kg and is 36cm to 39cm tall. The American Cocker Spaniel has a typical gundog temperament, with a keenly developed sense of retrieving. They are outgoing, friendly, and very sociable dogs. They make keen companions and are very good with children. American Cocker Spaniels require time and great care to bring their coat into full bloom. To achieve this frequent brushing and bathing is needed or regular trips to the grooming parlour. This applies not only when they are puppies, but also for the life of the dog. While the American Cocker looks very elegant when in full coat, many pet owners keep their dogs in ‘pet clip’ – leaving the coat only about 5cm in length on the legs and stomach. This significantly reduces the tendency of the coat to knot, and makes bathing, drying and grooming much easier. Families who are prepared to meet this breed's ongoing grooming needs, and want a companion to go ‘out and about’ with them will not be disappointed.